I used to wish that I could reverse back time and live that particular period of life again, to correct all my misjudgements and wrongdoings'. So that I become a better me- a person with no regrets at all. I realised... that wasn't what it was all about. To live life with absolutely" No regrets" isn't the most important thing. You are made up of your past... the happiness, the tears, the hurt, the setbacks. Everything that you experienced in the past made you stronger, this all builds up to the beautiful person you are today:). 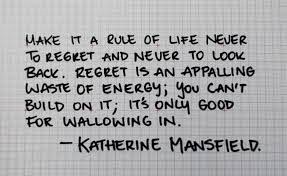 So here is the message I would like to give to my younger self : Don't live your life amongst all the regrets. Learning from your mistakes and moving on is the key to becoming a better and happier person.